Three more competitions in eight days saw the Killington duo, in harmony with French and Saunders Sharpie, win the Golden Putter (it’s not that Golden and tends to spend the year in the garage). Following that ‘Ever so Humble’ Allen and Yo Yo O’Neill were 1st and 2nd in the Bogey competition with outstanding 8+ scores and were both cut 2 to 18. I don’t think Yo Yo’s yo yo will be going up again anytime soon. Then in the Brazier Trophy equally humble Fantasy Editor triumphed alongside O Steve Abbott, Bill French, and, of course YO YO again. In the team we thought 87 for two better balls had to be a win, but it was only just enough as the scores were all very high – well played all. In other news we are pleased to welcome back our Captain Robot who is now buggying around as he recovers. ​Whilst he was laid low he was able to practice his chipping and putting, but sadly not his driving as Jesse James 3 wheeler became a 2 wheeler as Robot sped by. Meanwhile old stager Maurice has been watching the FedEx Cup highlights and saw the film of Bill Haas winning $10m dollars by playing from the beach at East Lake. As we now have a beach on our lake Maurice tried his luck and won a cup of tea. Jeanie and I entered the Village Cup mixed Greensomes last week and were drawn with Brian and Chris Wilkins. As it was raining and, as it was Brian, I expected to zoom round, but it wasn’t like that as to start with it was slow, slow, but then suddenly things changed and it was quick, quick, and then suddenly slow again. I wasn’t sure what was going on until I saw a picture of Brian, Chris, and their new activities in the paper (footnote we only made 3 holes before the greens got waterlogged and we retired for Guinness). If you are interested, the hole in my drive was filled in this week, but not before I got an in depth insight to where our gas bill money goes. Men arrive and dig a hole in the road, but don’t lay pipes; more men lay pipes, but don’t check gas meters, if pressure too low different men dig up drive and more (specialist men) lay (special) pipe. Different men arrive to relay paving, but cannot do it because they don’t fill in the hole so go away to wait. Man arrives to collect safety fencing and says ‘Oh – the hole isn’t filled in’ and goes. Man arrives to fill in hole then another man arrives, but doesn’t have new paving so orders it. Four days elapse so I ring to get message ‘Your hole is important to us and we are experiencing a high number of calls – please hold’. 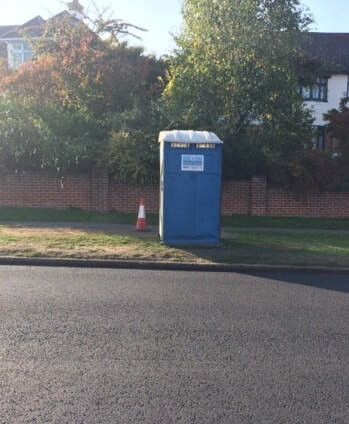 ​Finally the job is done but now the road resurfacing team have arrived and bingo – our house has been selected to have the potable Dav Lav outside. We are now on the run in the Fantasy Balon D’Or provided YO YO returns it. It’s Tony D’s to lose, but 2nd and 3rd are up for grabs and Mr Elsworth has a good lead in the last interim prize competition. NB Past 2018 Newsletters can be viewed under the Archive button.